Currently, 46 million people or nearly one in five nonelderly adults and children lack health insurance in the United States, an increase of 6 million since 2000. The recent rise in uninsurance has been attributed to a number of factors, including rising health care costs, the economic downturn, an erosion of employer-based insurance, and public program cutbacks. Developing effective strategies for reducing uninsurance requires understanding why people lack insurance coverage. 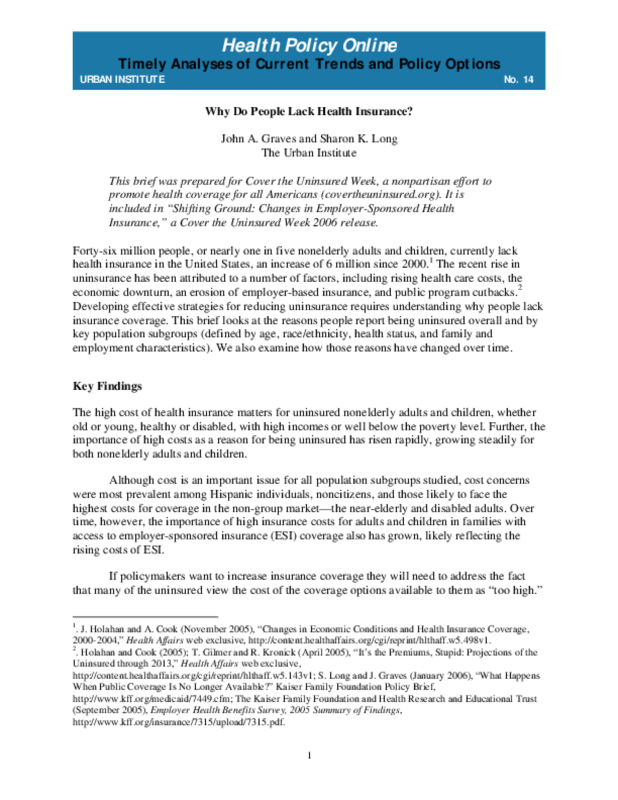 This brief looks at the reasons people report being uninsured overall and by key population subgroups (defined by age, race/ethnicity, health status, and family and employment characteristics). We also examine how those reasons have changed over time. Title: Why Do People Lack Health Insurance?